In designing a vessel the sizing of the rudder is usually carried out with an eye to ensuring necessary directional stability and the functions of control and manoeuvrability. From the viewpoint of fluid dynamics the efficacy of the rudder in producing a yawing moment is linked to the lift force exerted on the fluid and therefore, with the geometrical features of the appendage established (dimensions, characteristics, profiles), to the square of the velocity of the incidence flow. This is why rudders are typically installed downstream of the propulsors so that they function in an averagely accelerated flow and ensure efficient steering of the vessel through slight variations of rudder angle. 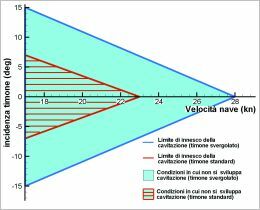 In fact, having established the geometrical characteristics of the rudder, with an increase in velocity one obtains the same lift and therefore the same yawing moment, setting out from a lower value of hydrodynamic incidence, and greater response to variations in rudder angle (Figure 1). 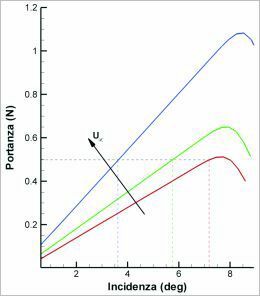 An increase in velocity moreover gives greater energy to the flow which will tend to separate from the rudder surface with increasingly higher values of incidence, as demonstrated by increase of the CLmax (maximum lift coefficient) and the critical incidence (Figure 1). However, apart from these advantages, installation of the rudder behind the screw introduces numerous side effects, essentially connected with the non-stationary nature of the slipstream created by the screw and its interaction with the appendage. 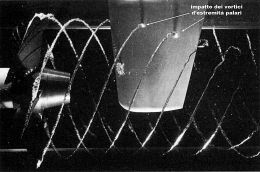 In particular: the propeller slipstream is characterised by strong cross-flow velocity elements due to the rotation effect imposed by the propulsor. In this way the rudder, even if it is constructed with symmetrical profiles and in cruising trim, will be working with non-zero values of hydrodynamic incidence and consequently with the possible increase of depression peaks on the dorsal edge and the triggering of cavitation, from speeds of around 20 knots (Figure 2). 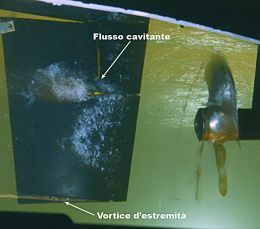 The presence of cavitating zones leads to progressive erosion of the rudder surface with considerable repercussions both in economic terms - the need to periodically repair or replace damaged parts - and in terms of hydro-acoustics and comfort aboard for passengers and crew (Figure 3). The rudder may cause a general reduction in propeller performance and efficiency, in some cases accompanied by cavitation also on the prop blades themselves (configurations with the rudder very close to the propeller or pulling-POD type drives). 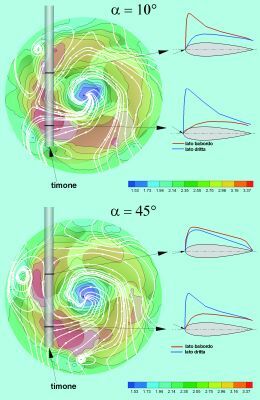 With view to giving an idea of how best to interpret the response of the rudder to the perturbing action of the propulsor it is worth pausing for a moment to look at the hydrodynamic features of flow upstream and downstream of the appendage. The fluid-dynamic field around a rudder installed behind the propeller is manifested through a complex phenomenology that arises from the non-stationary and three-dimensional nature of the flow in which there coexist great vortex-filled structures (blade extremity vortices, rudder extremity vortices), powerful velocity gradients and high turbulence values. Upstream of the appendage the flow is periodic and not uniform due to the effect of the slipstream created by the propulsor. Distribution of velocities at the leading edge of the appendage modifies the distribution of hydrodynamic incidence with regard to nominal functioning conditions (rudder in uniform flow), with variations both in spatial terms, along the rudder opening (Figure 5), and in temporal terms, due to the highly non-stationary characteristics of incident flow (Figure 6). The presence of cross-flow velocity components in the propulsor slipstream induces high hydrodynamic incidences on the rudder, even in cruising trim. This circumstance determines the creation of intense vortex-filled structures, in correspondence to the sections at the root and at the extremity of the appendage, which interact with the slipstream created by the rotor, contributing to extreme distortion and destabilisation of the blade extremity vortices. Interaction between the vortex-filled structures of the propulsor and the rudder is accompanied by a palpable increase in turbulence and consequently by a general drop in appendage efficiency. The energy absorbed by the turbulent movements is in fact an important indicator of the propeller-rudder system's hydrodynamic efficiency inasmuch as it represents that part of energy transferred from propulsor to flow which does not actively contribute to development of lift but is unfortunately dissipated or converted into noise and vibration. So in this sense the regions of flow where the peaks of turbulent intensity are found constitute potential sources of "noise" and cavitation (Figure 7). The value of hydrodynamic incidence on certain sections of the rudder may in some cases reach critical value, causing detachment of the fluid vein with consequent loss of appendage efficiency (condition of hydrodynamic stalling). Most directional rudders adopted in the shipbuilding field have symmetrical profiles with progressively increasing thicknesses from the extremity sections to those of the root and, in some cases, tapering with view to reducing hydrodynamic load in the extremity sections. This solution of course, while resulting in lower costs of design and construction, produces modest performances in hydrodynamic terms since it sets aside any implication deriving from interaction with propulsor slipstream. 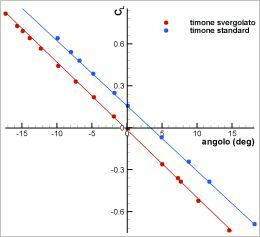 Palpable improvement in performances may be obtained by aligning the profiles with the local direction of incident flow in such a way as to make up for the variations of the leading edge angle induced by the propulsor slipstream. Of course the non-stationary nature of the hydrodynamic load on the rudder makes this condition wholly ideal since in practice it is not possible to modify the twist of the appendage at the same time as the variations of hydrodynamic incidence. A practically viable solution is rather to align each rudder profile with average flow direction during rotation of the propeller. 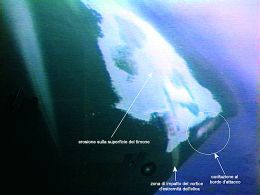 minimising the local value of hydrodynamic incidence there is a reduction of peaks of depression on the dorsal surface of the rudder, thus delaying cavitation triggering conditions. On this subject, Figure 8 shows a diagram with the triggering limit in function of rudder angle and the cruising speed of the hull, with conventional rudder and twisted rudder: adoption of a twisted configuration produces an increase in speed and therefore cavitation arises at about 20%. 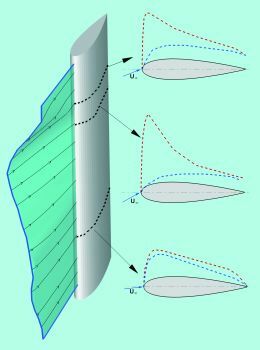 Reduction of hydrodynamic incidence determines a lower intensity of the vortices created by the rudder and therefore reduces the effects deriving from interaction with the vortex-filled structures of the screw. Alignment of the profiles with the average direction of incident flow on the leading edge during rotation of the propeller consequently minimises problems linked to the non- stationary nature of the incident flow. Experimental studies have demonstrated a slight performance increase in manoeuvres with regard to traditional configurations. In particular one may observe that alignment of the profiles with the local flow direction produces two positive effects on the lift coefficient, on the one hand increasing the critical angle of incidence and, on the other hand, producing greater response to the variations of rudder angle, as a consequence of the greater inclination of the lift line (Figure 9). Twisted rudders are therefore the best compromise between the opposing needs of setting the appendage in an accelerated flow and of minimising the negative effects triggered by its interaction with the propulsor slipstream. 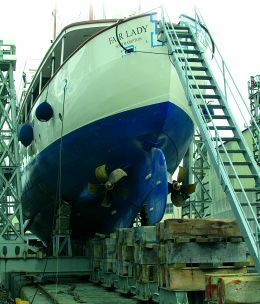 The availability of powerful diagnostic techniques of an experimental type and advanced instruments for numerical simulation and hydrodynamic optimisation have paved the way to the design of twisted rudders with a high degree of accuracy regarding objectives of comfort and manoeuvrability of the vessel. On this subject the National Institute for Naval Architecture Study and Experiment (INSEAN) has recently set up a programme aimed at fine- tuning a methodology that integrates skills acquired in the development of innovative numerical and experimental techniques for design and verification of new-concept high-performance rudders. The aim is to suggest and offer to shipyards an instrument that could become an integral part of boat design, guaranteeing a return both in terms of performance and financial profit.